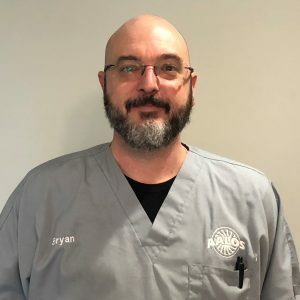 Bryan worked for AALOS as a Technician from 1999 to 2004 while completing his Bachelor’s degree in Finance at Troy University in Montgomery. During this time, he attended various conferences and seminars in order to further his knowledge in the field of prosthetics. After experiencing several other career paths, including operations management, accounting and parts management, Bryan had an opportunity to return to the field of prosthetics. Bryan was excited to return to AALOS team to work in a field he greatly enjoys. In his free time, Bryan enjoys spending time with his wife, Cayce, daughter, Baylie, and friends. He also enjoys playing golf and watching Auburn Football.